In late summer many of our favorite steelhead rivers are at their lowest. The fall rains are still a ways off and many rivers are crystal clear. Although inviting looking to the average swimmer, the seasoned steelhead angler looks at this clarity and recognizes the challenges it creates. Fish will be spooked easily in such water, and are difficult to approach. They will be more wary and investigating a swung wet fly drops lower on their list of priorities. The playing field shifts the odds in their favor, but the determined and dedicated angler is prepared to take some counter measures to meet his goals. Here are 5 tips to improve your low water steelhead game. 1. Be on the water early, or very late. Early morning and late evening provide the best fishing conditions. The water will be at its coolest and the fish will be more comfortable. When water temperature is above 65 degrees, steelhead become lethargic and dull. Some would refer to them as “turned off”. There is also shade in the mornings and evenings. Most steelhead are caught during lower periods of light. Whether this is because low light was when they fed at sea, or they simply aren’t blinded by the sun and can clearly see the fly, is anybody’s guess. When fish are easily spooked, our tackle can be of concern. 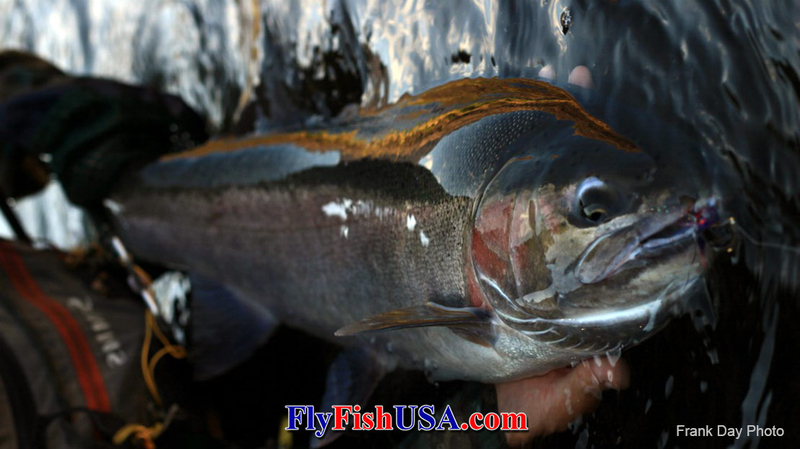 The heavier it is, the more intrusive it is into the steelhead’s world. If you fish lighter more delicate lines and leaders you are less likely to spook fish. The softer your line system lands the more likely the steelhead will maintain position and intercept your fly. It’s pretty hard to catch a steelhead when a 600 grain Skagit head landing right in front of him has either sent him into the next run, or has his head buried between some boulders in the tail out. 3. Smaller flies can work better. Just like our tackle our flies can be downsized as well. Smaller flies can be more productive in extremely clear water. Steelhead are incredibly perceptive of the world around them and are frequently hooked on size 16 and 18s by trout anglers. There are even stories of fish attempting to eat the blood knot in leaders. If it seems laughably small it may be the ticket. Flies in more natural colors can also be more productive. Flies that are more apt to make a steelhead curious, than wary is the key in fly selection. Remember that these fish don’t have to eat anything and are simply acting on fight or flight impulses. 4. Fluorocarbon tippet can make the difference. We mentioned just above that fish are highly perceptive of their environment. If a steelhead is attempting to eat part of your leader it can clearly see it. For some fish it doesn’t matter and they would eat car keys looped directly to your Scandi head, but that’s a fraction of them. To allow ourselves more opportunities to hook a steelhead we need to appeal to as many of the fish present as possible. If they can’t see your leader they’re more apt to investigate your fly. Fluorocarbon tippet can help this. Fluorocarbon has almost the same refractive light index as water. This makes it nearly invisible when submerged. In extremely clear water this can be the difference between swinging to 5 fish in a run and hooking none, or maybe taking 2 or 3. 5. Dress to blend in. 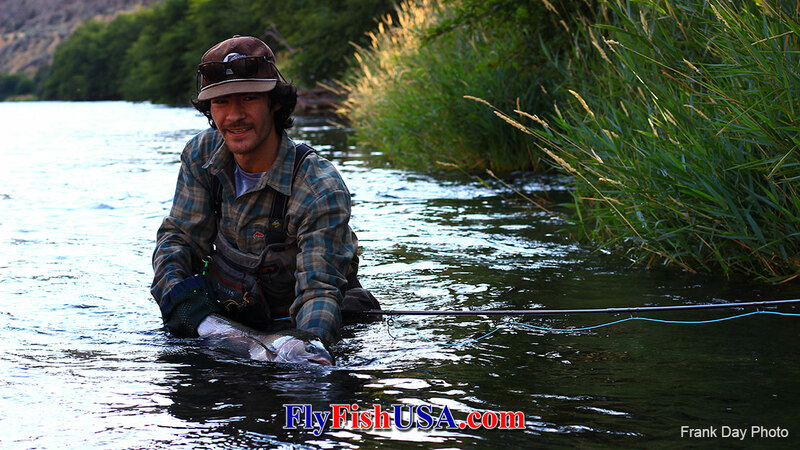 Remember that swinging for steelhead is more hunting with a spey rod than it is fishing. Blending in with your environment will allow you to get closer to your target without giving yourself away. Steelhead are much easier to catch if they aren’t aware your there. Or if they are aware of your existence, your presence is unobtrusive enough that you do not alarm the fish. When the water is low and clear, wear earthy tones in grays, tans, browns, and greens to blend in with the back ground of your river. If you want to get ‘em to the beach, best leave your favorite fluorescent orange shirt at home.